Click below to enlarge the field trip images. Click above to enlarge the field trip images. Click on the photo above to go to the Mission: Wolf website. 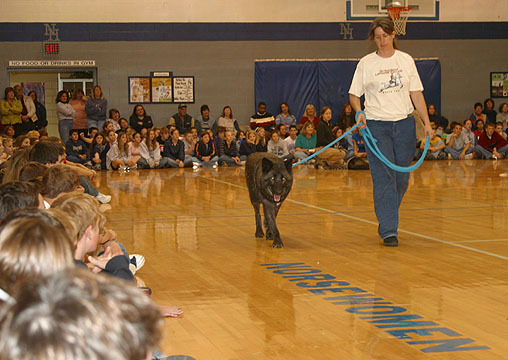 Click here to read a TOPEKA CAPITAL -JOURNAL article about Mission: Wolf at Northern Hills Junior High School. Camp Creek Wetlands is located in the southeast corner of Shawnee County, Kansas. It is a unique habitat that provides a wonderful outdoor classroom, and it is often used by educators and their students. Check out a photo from a past field trip at: http://tcslacerta.tripod.com/tcsphotos/id1.html . Many places make excellent outdoor classrooms. A few other examples can be found from some of the links at the top of this page. 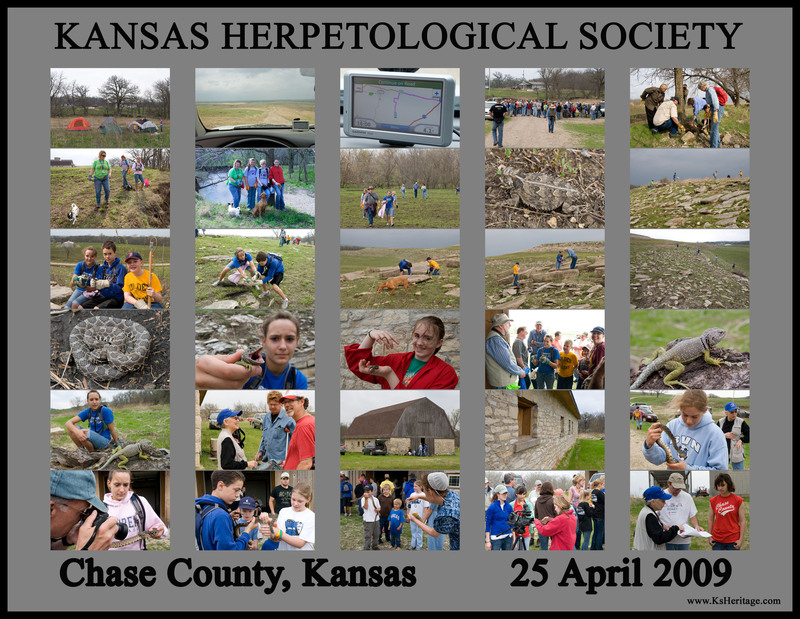 The "ALIEN LIZARDS of Topeka" is one that everyone should visit. Also, the "Caldwell, Kansas" link has interesting information about one of our state symbols. Check out the "Comet" link too! One of Mr. Miller's original websites is: ( http://tcslacerta.tripod.com/tcsphotos/ ) and it will direct you to many others. DO NOT FORGET TO SIGN THE GUEST BOOK when you visit ( http://tcslacerta.tripod.com/tcsphotos/ ). The Topeka-Shawnee County Public Library is the pride of the Topeka area. Mr. Miller's wife, Suzanne, works for the Bookmobile division. Kansas Citizens for Science is a rather new non-profit organization that prmotes the teaching of science in our Kansas classrooms. Mr. Miller taught in the Caldwell, Kansas school district from 1971 to 1990. Mr. Miller graduated from Southwestern College in Winfield, Kansas in 1971. Mr. Miller attended Wellington High School in Wellington, Kansas from 1965 until he graduated in 1967. Mr. Miller attended the South Haven Public Schools located in South Haven, Kansas from his 3rd grade year until 1965. Mr. Miller started school in a one room school (White Horn School) located to the northeast of South Haven. He attended school there until it closed. It was a 1st to 8th grade school and was located about one half mile south of Mr. Miller's farm home. White Horn was not Mr. Miller's first experience with an outdoor classroom. He lived on a farm, and he spent most of his free time outside exploring. However, White Horn was his first experience with formal education, and the one room school offered an outdoor classroom right outside the door. Animals such as Texas Horned Lizards were common on the playground, and it was not uncommon to see a large Bullsnake or other species of snake on the playground. Ornate Box Turtles were often kept in the classroom. 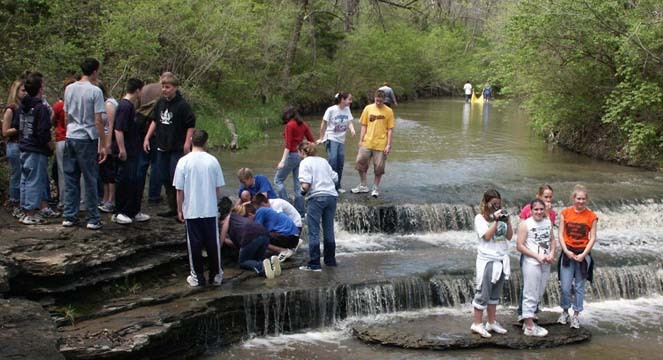 The students at times took field trips to a nearby creek. Once in a while those field trips would involve fishing. Students at times brought their fishing poles to school. Some of the older students sometimes brought their guns to school! It was not uncommon duirng hunting season since many of the students and their parents hunted small game. In fact a rabbit shot on the way home from school (most older students walked the mile or so to school) often became part of the evening meal for the family. Guns were left at the back of the room duirng the day. Of course they were unloaded and the actions were always left open for safety reasons. There were never problems. 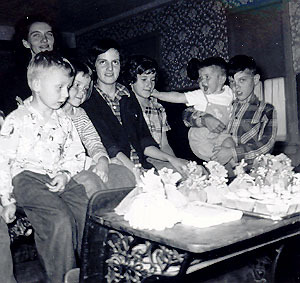 The photos below were taken during the 1954-55 school year. They show the students that were attending White Horn at that time. Both were taken at some type of party. Students have always liked to party! Mr. Miller would like to hear from anyone that attended White Horn school during the early 1950's. If you attend the one room school, or if you know of someone who did attend, you can e-mail Mr. Miller at: wakarusa@mac.com. 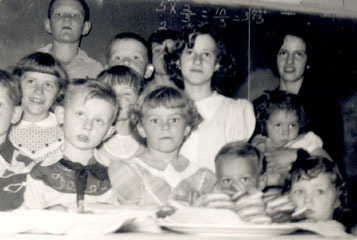 Students at White Horn School in Sumner County, Kansas. Photos taken during the 1954-55 school year. White Horn School was located west of Portland, Kansas and northeast of South Haven, Kansas. The school buildings and land was sold after the school closed at the end of the 1956-57 school year. The buildings were moved and the land became part of a farm owned by a woman living in Iowa. Click on this text to view another photo of Mr. Miller and some of the other students that attended White Horn School during the 1954-55 school year. Photos of Mr. Miller as a teacher in Caldwell, Kansas can also be viewed at this location. Click on the "Casita Travel Trailer" link below to find out how Mr. Miller often gets to some of the Outdoor Classroom locations he now explores. A lot has changed since his days at White Horn School. 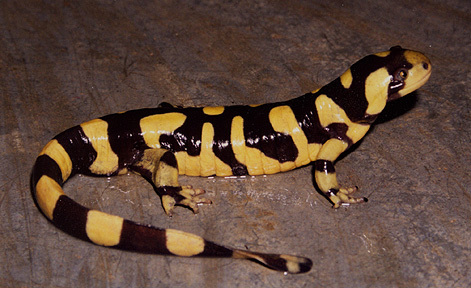 Clicking on the photo of the Tiger Salamander will take you to a website titled INTRODUCTION TO EVOLUTIONARY BIOLOGY. From that site it is possible to access a wide variety of information in regard to the evolution of life on Earth. There are a number of FAQ's along with links to both scientific and religious websites. to an INTRODUCTION TO EVOLUTIONARY BIOLOGY website.